The 25th edition of the annual World Travel Awards 2018 which is recognized globally as the ultimate hallmark of quality, with winners setting the benchmark to which all others aspire saw Sri Lanka as being awarded Asia’s Leading Adventure Tourism Destination at a gala ceremony. Each year, WTA covers the globe with a series of regional gala ceremonies staged to recognize and celebrate individual and collective success within each key geographical region. This year, the Asian and Australasia Gala Ceremony was held on 3rd September at the Intercontinental Grand Stanford Hotel in Hong Kong which saw the participation of industry stalwarts and new entrants from around the world. The Sri Lanka Tourism Promotion Bureau was awarded as “The Asia’s Leading Adventure Tourism Destination 2018” at the ceremony. The award was received by Dehan Seneviratna, Chairman and Prasad Daluwatte, Director Events of the Sri Lanka Tourism Promotion Bureau. 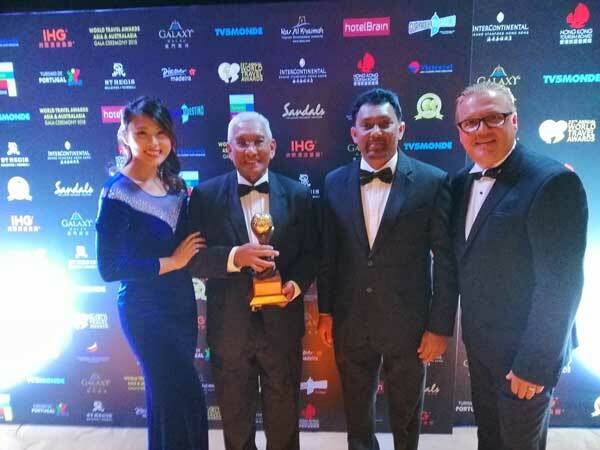 The World Travel Awards Asia & Australasia Gala Ceremony 2018 focused the region’s most prestigious travel and tourism event of the year and brought together the leading the figureheads and VIPs from across Asia and Australasia. The awards were voted for by travel and tourism professionals and business and leisure travel consumers worldwide, and this accolade recognizes the commitment to excellence that an organization has demonstrated over the last twelve months. The evening marks the third leg of the World Travel Awards Grand Tour 2018, the 25th anniversary of honoring excellence in the international hospitality industry. At the Gala Ceremony, the formal announcement of the winners and stage presentations of the award were taken place along with filmed media interviews. The WTA gala ceremonies is regarded as the best networking opportunities in the travel industry, attended by government and industry leaders, luminaries and international print and broadcast media.